You may have noticed it’s been pretty quiet around here. This isn’t because I’ve been out partying every night (honest, Dad! Well, maybe a bit…), but because this semester seems like a very busy time. Alongside our normal course workload, we’ve been working on a collaboration with the illustration students at the Edinburgh College of Art. We paired up with an illustrator, and then we exchanged work: the writers respond to an image and the illustrators respond to a short piece of text. We now have two paired text-and-image pieces, one of which we get to choose for a book and an exhibition. I’m really lucky, my collaboration partner is a fantastic artist, and she’s lovely too! Events so far include an exhibition launch at the Forest Cafe on March 1st, and a book launch at the same venue on March 25th. There will be readings at both events. 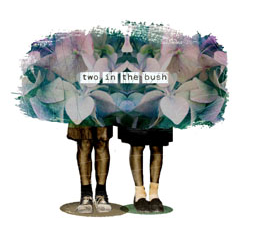 I’ll add more information as and when I know about it, but for now here’s the blog for the project: http://blog.eca.ac.uk/twointhebush/, which we have entitled Two in the Bush. (I know).